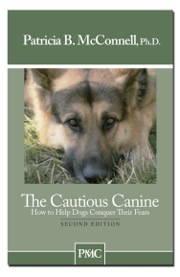 One of Dogwise’s “Top Ten Training Books,” The Cautious Canine has been used by over 80,000 dog lovers all over the world. Step by step, it clearly and concisely explains how to use classical conditioning to change “Oh No!” into “Oh boy!” There’s a lot of information in this 30 page eBook; use it as a guide and inspiration to a happier dog. For more information on dog-dog reactivity (many dogs who are “dog-dog aggressive” are fearful), also see Feisty Fido and the Dog-Dog Reactivity DVD. See For the Love of a Dog to become an expert on “reading” dogs and knowing when your dog is nervous or anxious. An essential guide in the library of thousands of trainers, this eBook increases your effectiveness by giving clients a clear, concise summary of effective and positive behavior modification. There’s a reason so many people have bought the paperback version! Equally useful for a novice and a seasoned professional, The Cautious Canine is a practical step-by-step guide that can help everyone stay on track. Whether the problem is growling at strangers or barking at unfamiliar dogs, the paperback version of this popular booklet has turned tens of thousands of dogs from “trouble” to “best friends”. Help your clients address a common behavioral issue, and prevent a more serious one by recommending this simple, easy to follow booklet (now available as an eBook) that is based on scientifically proven and humane methods. Increase the adoptability of nervous or fearful dogs by recommending this easy to read booklet to their new families. Let The Cautious Canine help ensure consistency once a dog is in a new home, and increase its chance for a successful placement.